SoftPlanet makes it possible for everyone to get free PhotoSort download directly from our servers. There is no registration needed for downloading. PhotoSort 2.40 is visual search engine software, which detects duplicate images on your PC based on visual data. The program works in the same way people look into pictures. It compares black and white versus color images, photos of different sizes or digitally edited ones. Once you run the app you will remain speechless by its results. Finding duplicate images is not an easy task, but PhotoSort manages to do it just perfectly. Actually, you are able to define the level of tolerance on your own. Thus you can shrink or expand the results. The program comes with a built-in image viewer and side-by-side preview. It is great that PhotoSort supports batch processing. 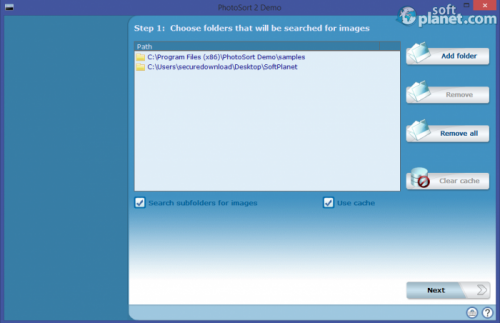 Thus you can simultaneously delete, move, hide or rename multiple image files. The app comes with a step-by-step user interface, so it is very easy to work with it. Basically, there is no wrong way of doing things. Once you run the app for the first time, there will be some tooltips, which will explain to you the basics about its interface components. When PhotoSort finds duplicate pictures and displays the results, you can get side-by-side preview to the left. The tolerance level bar sits to the right, so it is easy accessible. The program is fully scalable, so you won't have any challenges even though you get multiple search results. 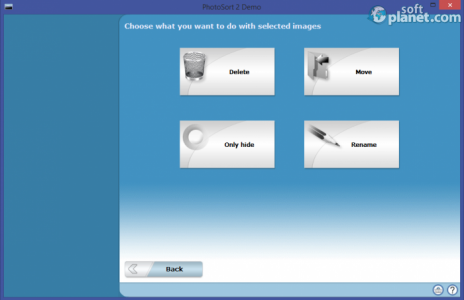 As you have already known, PhotoSort 2.40 comes with a wizard-like graphical user interface, so the program is extremely easy to work with it. First you need to select the folders, where the app will look for image duplicates. In order to filter results, you can use its integrated tolerance lever bar.With a single click, you can shrink or expand results. Second mark files you want and select an action. There are four options – Delete, Move, Only hide and Rename. Unfortunately, since this certain version of the software is a demo one, you cannot perform either one of them. 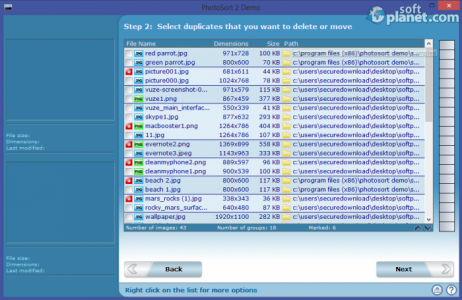 PhotoSort v2 is a great duplicate image file detector, based on visual data. It offers great functionality. Unfortunately, in case you want to take advantage of some features, you need to purchase it. However it is really worth it. We look forward to your feedback. Cannot perform any actions with the demo version. Our security scan shows that PhotoSort is clean from viruses. The current version of PhotoSort has been scanned by our system, which contains 46 different anti-virus algorithms. That ensures that PhotoSort 2.40 is 100% safe for your computer.